Paulele is a beautiful Hawaiian-style home right on the closest beach road (Weke Rd.) on breathtaking Hanalei Bay! This tasteful and comfortable home has four bedrooms, five baths, a fully-equipped kitchen, and it comes with everything you’ll need for a wonderful visit to this 'Old Hawaii' Garden Island paradise. You’ll enjoy spectacular ocean, mountain, and waterfall views from many areas of the home and the world-renowned Hanalei Point surf break is in full view from the convenience of your front porch! With the short path to the beach just one lot over, you're 100 yards from the bay. There are two identical master suites, each with king beds, spacious bathrooms, as well as private entrances and lanais. The third bedroom has two twin beds, which can be converted to a king, and full bath with tub, while the lower level fourth bedroom has a king bed, shower bath, and private entrance. For your comfort and convenience, there is an outdoor bamboo enclosed hot water shower, laundry room, covered shuffleboard court, and covered hammock, as well as lots of beach gear (beach towels, mats, chairs, umbrellas, and kids boogie boards) and yard games (horseshoes, bocce ball, badminton and croquet). The oceanview dining area seats eight, with additional stools at the bar and a four chair game table with plenty of games, puzzles, and books. Many guests feel our home to be a destination in itself with so many comfortable areas to spend time. And best of all, the warm water and beautiful sand beach of Hanalei Bay is just across the street! Generally, the ocean is calm in the summer and surf is bigger in the winter, sometimes reaching ‘big wave’ status. Located within ten minutes of several north shore beaches, you’ll have many options for swimming, surfing, wind and kite surfing, snorkeling, and many other activities. The famous NaPali Coast trail has its main access just down the road. A short walk from the home is quaint Hanalei town with its many shops and restaurants. We first fell in love with Kauai during our family's first visit in May, 1992. While my husband insisted we couldn't possibly leave our business for a two week vacation, I planned a week on Napili Bay on Maui and a second week on the South Shore of Kauai. In the middle of that second week, we ventured up to the North Shore. I can still remember the feeling as we first arrived at Hanalei Bay. 'Ahh, this is it!' I proclaimed, and, for us, it has remained so. The beauty of the Bay was so stunning it felt surreal. The lush green mountains were lined with waterfalls and the Bay seemed to stretch on forever. There was hardly anyone on the beach and no hotels down on the Bay. It felt as if we had gone back in time to the 'Old Hawaii' of my dreams. ...Plantation style homes dotting the beachfront with lots of wide open spaces... By 1996, we knew we would always want to come to Hanalei and we started looking to buy a home. We started renting the home that is now Paulele, but it was not for sale. We looked for 3 years at just about everything that came up for sale in Hanalei, but didn't like anything as much as this house. 'We need to trust', I told my husband. 'Have faith that if it's meant to be, it will happen'. Well, it did. Without ever going on the market, the previous owners finally succumbed to our persistence and sold us the home in 1999. We named it 'Paulele' which means to believe, have faith and trust. In Hanalei, magic happens. Come visit. We hope you enjoy our home and Hanalei as much as we do. At Paulele, the beach is always just a few steps away any time of day. Whether an early morning stroll, a mid-day swim or surf, or a gorgeous sunset, it's all right out in front of you. If you need groceries or want to treat yourself to a dinner out, no need to get in the car. Just walk into town and it's all there. We love our location for these and many reasons! We hope you enjoy the activities that we've offered right at Paulele. We love shuffleboard, horseshoes, bocce ball, badminton and croquet, so we have all of them right there for you to enjoy in our fantastic yard. Do you love to read? I do, so you'll find a bookshelf waiting for you. Plenty of deck space, both sunny and covered, for you to relax and a bamboo enclosed hot water shower that we built ourselves are other nice features. And can anyone really get away without internet? It's there if you need it! Each bedroom has its own private bathroom, plus there is an additional bathroom off the TV area of the great room for convenience during the day. The outdoor hot water shower is enclosed for privacy and has dispenser with shampoo, conditioner and body wash for your convenience after the beach. You'll find a hair dryer and magnifying mirror in each bathroom. View of Hanalei surf breaks right from front lanai! Ocean view from dining room, kitchen and living room. Electric coffee maker and grinder plus French press. Coffee filters provided. The main dining table seats 8. You can also eat at the tables on the front lanai for both ocean & mountain views or on the picnic table on the back covered lanai for beautiful mountain views. Our large backyard is great for enjoying one of our yard games- choose from badminton, croquet or bocce ball. We also have a full size covered shuffleboard court! Great ocean & mountain views, private shuffleboard court & 1900 square feet of wrap-around decks, covered lanai with hammock & picnic area, fully-equipped kitchen, game table with games, puzzles, books, outdoor hot water shower, beach equipment, bamboo & oak floors, ceiling fans, vaulted beam ceilings, large central skylight, 4 Cable TV's, Stereo with radio, tape & CD Player, Iron & board, Refrigerator, Gas Grill ( with 3 outdoor dining areas) In season, enjoy fresh fruit from our avocado, orange, papaya and lemon trees! Four Bedrooms and Five Full Baths with plenty of privacy to enjoy sharing a home with your favorite people! Wonderful accommodations for two families and a perfect location! Easy walk to beach as well as shops. Owners very proactive and always available. We hope to visit again and would love to stay again. My family and I just completed our 10 day vacation at Paulele. This was our 4th year in a row. It is one of the best in all of Hanalei from its location central to everything,all the amenities one would ever need and it’s owners who are so responsive if there is anything that needs attention. We have rented many homes over the years and I will say that a vacation at Paulele is one of the best! The Paulele Beach House is not just some vacation rental. No- it is a fabulous home, located in the most picturesque of locations, stocked with every amenity you could need (even for babies), and is owned and operated by someone who truly cares about every detail of your experience. The most stress that you will encounter while staying here is deciding whether to look toward the beautiful ocean or the incredible mountains while sitting on the deck enjoying your coffee/cocktail. Myself, my wife, the four of our parents, and our 8 month old child had a great time and will very likely be returning again in the future. Thank you again Anne + family! Lots of room and privacy. Kitchen extremity well equipped. This VRBO property exceeded our expectations and was everything as advertised. This is a beautiful and comfortable home. 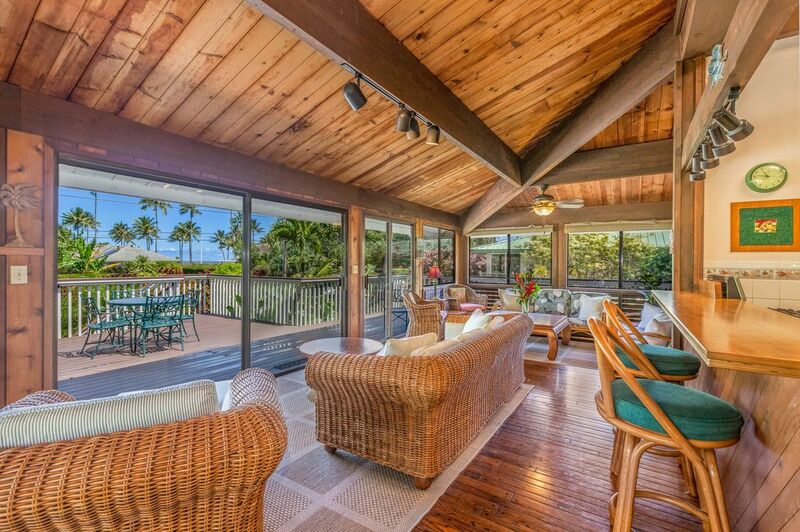 It is ideally situated in Hanalei with easy access to the beach and town. The home was perfect for our annual family vacation of 7, 5 adults and 2 grand children. The owners take great care to provide all the essentials, with clear and helpful information to maximize the enjoyment of your stay. The owner, Anne, was professional and graciously available for the few times needed. We have utilized several VRBO homes over the years and the vote by each family member at the end of the trip was that this was the best and we should come again. Mahalo for the great experience. We thoroughly enjoyed our stay at Paulele House. Short walk to the beautiful beach and short walk to town too. The owners outfitted the house perfectly , cant think of a thing we didn’t have at our fingertips. World class surfing on Hanalei Bay (ocean conditions permitting), Hiking (the famous NaPali Coast trail head is only 15 minutes away! ), Shuffleboard (onsite), Horseshoes, Zip Lines, ATV rentals, Water tubing, Kite surfing, boat tours, botanical gardens, horseback riding, helicopter tours & more nearby. All shops and restaurants of Hanalei town are a short walk away. Children, including infants, are considered guests for the purpose of guest count. Maximum guest count is 8. Please inquire without "Book it Now" if you have more guests. Rates are subject to change until reservation is confirmed. For stays longer than one week, a weekly maid service is required ($100 each). Please no smoking or pets! Five night stays available only if adjacent to existing reservations. Hawaii Tax ID# W40967548-01; Kauai County approved vacation rental TVNC#1106 Please check availability calendar for your desired dates. NOTE: We accept only personal checks or E-Checks. Credit Cards NOT accepted or 3% charge will be added. Cancellation policy is 90 days notice for refund of deposit paid to us less $100 cancellation fee (not 60 days as noted below in VRBO's default post). Thanksgiving and Christmas reservations have a 180 day cancellation policy. If cancelled within 90 days of arrival date (or 180 for holidays), we will refund whatever net rent we collect if able to rent to another guest for the same dates, less $100 cancellation fee. We suggest trip cancellation insurance for this reason.